The COBB Tuning Downpipe is one of the premier modifications most owners look to upgrade on their vehicle. By opening the diameter of exhaust flow coming out of the turbo, the downpipe unleash power where the stock restrictive unit lacks. 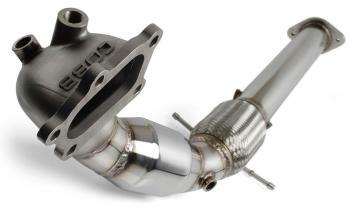 The COBB Tuning Downpipe comes in two variants, street and race. The Street version comes with a single high flow catalytic converter, where the Race version downpipe lacks the cat, thereby freeing up an additional 1-3hp over the catted version. The Race version is recommended for dedicated track use. The downpipe is the first step to any enthusiast looking to unlock the potential of their engine, while still maintaining a stock look around their vehicle. I had the down pipe installed on my 2010 Evo X GSR about 2 weeks after buying the car. I love the part, it has made quite a bit of difference from the stock parts.